I stopped at Pet's Plus last week after getting my new drivers license. 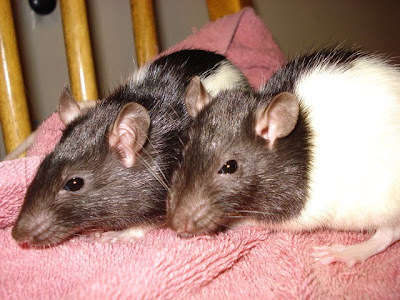 I just went into look but they had 1 each male & female Blue Hooded rats. I wanted to get the female, but the manager explained they were treating the blue hooded ones for mites right now and he didn't want to let me take her home until she is mite free. He did say, if I wanted to buy her he would mark her as sold and they would call me when she finished her mites treatment and the vet gives the okay. So... of course I got her! She's a big girl too, she must be an older rat because she's almost as big if not bigger than my Ginger. Her name is going to be Hazelnut, and I can't wait to bring her home! They also said they had some feeder rats, all different colors in the back so I went to take a look. They had a bunch of PEW girls and two little black hooded babies. They are so itty bitty they can't be more than month or so. I told him I'd take the the two black hooded girls too. Sooo.... please meet Pepper & Poppy. They don't have perfect hoods- Pepper's stops mid back and Poppy's almost reaches her tail. They are soooo small, just babies really. Poor babies... I can't believe they were going to let them become feeders! I only really meant to get the blue hooded girl, lol. But when I saw those babies, I just couldn't resist! Bad case of GGMR! (Gotta Get More Rats!) I definitely won't be getting anymore ratties anytime soon, 7 rats is more than enough! Good thing I have a huge Ferret Nation cage! Holly & Ivy are getting along with Ginger and Saffy. So far no issues. 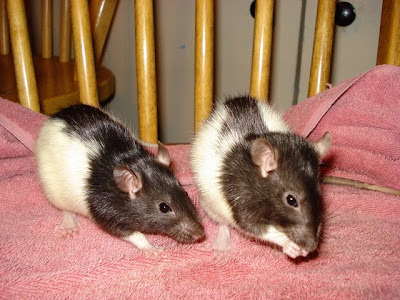 Saffy & Ivy did squabble a little, I think Saffy is my Alpha Rat. Ginger, I have to make an appointment for her at the vet for next week. I've been waiting for my first paycheck before I made the appointment. She will definitely be getting her tumor removed hopefully by the end of this month. In other news, Philadelphia got 28 inches of snow on Saturday! It was the 2nd biggest snowstorm in the city since 1996! It's definitely not going to be fun digging the car out and driving to work Monday morning. 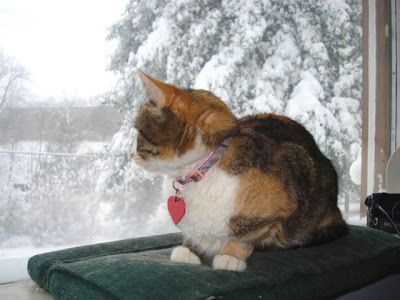 Tansy enjoyed the snow, from her warm window seat!